Another H.P. Lovecraft story gets the graphic novel treatment and again its done by I.N.J. Culbard. This is possibly the oddest of the Lovecraft stories I have read so far, which combines elements of horror and fantasy. Unpublished during Lovecraft's lifetime, The Dream-Quest Of Unknown Kadath is part of his 'Dream Cycle' of stories. The story follows Randolph Carter who upon dreaming of a place several times finds a way to make his dreams bend his way. He searches a mysterious place and comes across various creatures and people who tell him it is a place not to go. Carter ignores all the warnings and continues his search but what he finds could drive him further from reality. This is another well drawn and adapted story released by SelfMadeHero. The story has yet to be made into a short film or feature film, but if it ever did it would take a very skilled filmmaker to bring this world to life. If you are new to Lovecraft's work this is probably not the best work to start with, but it does make for an interesting read throughout. 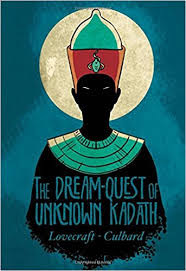 The Dream-Quest Of Unknown Kadath - A Graphic Novel is published by SelfMadeHero and is out now. (144 pages, colour. Available in paperback).